OK, you have been archiving your Gmails regularly, but now the time has come to access some of those Gmails. 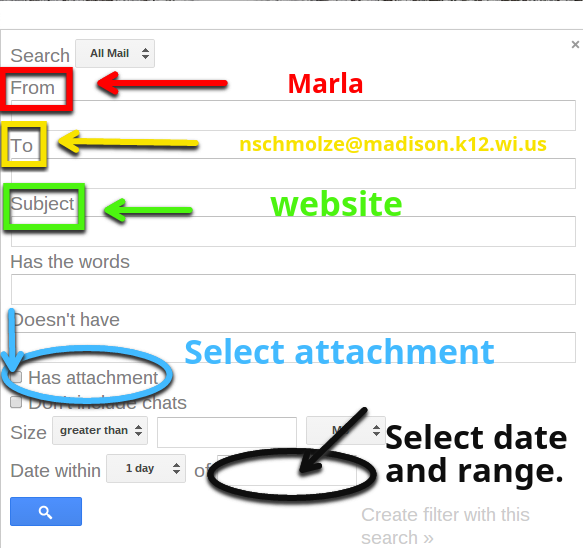 In this post we will look at two examples of using Gmail's Advanced Search - clicking the arrow. In our first example, we use the From, To, and Subject fields to filter our results. Our end result is a few emails from Marla, to me, with the subject website. If I was looking for a particular email where Marla gave instructions, it is highly likely to be in one of those emails. In our second example that strategy won't be as useful. We are looking for photos sent by many people with multiple subject headings. Instead we select attachment and a date range. This gives us all Gmails with an attachment within a particular date range. The results weren't perfect but close enough since all the photos were sent on June 9th and 10th, 2014.